Andrei Tarkovsky's debut feature, Ivan's Childhood, kind of looks like an anomaly compared to the rest of his filmography. The auteur behind dense, cerebral and stark films like Solaris and The Sacrifice began his career with a transcendent emotional gut-punch. One couldn't fairly describe Tarkovsky's work as universally cold and distant, but there's an immediate emotional resonance in Ivan's Childhood that's unlike anything else I've ever seen from the Russian master. Jumping back and forth between reality, memory and dreams, the film centers on 12-year-old Ivan (Nikolai Burlyaev, in one of the all-time great child performances), a boy who has lost his mother, father and sister to German attacks in World War II. Desperate for revenge, Ivan begs a group of Russian soldiers to put him on the frontline and bristles at their insistence on sending him away to military school. Ivan's Childhood is one of those war films that barely depicts any actual war, opting instead to show its physical and psychological effects on Ivan, while contrasting that with flashbacks to an idyllic past long since destroyed. Ivan's Childhood does anticipate Tarkovsky's carefully controlled long-take camerawork, and there are a number of images here that are instantly indelible, whether depicting present-time horrors, a brief romantic respite or fantasies of a simpler time. A tracking shot through a swamp that settles on a pair of Russian corpses, desecrated as a warning sign by the Germans, is unforgettable. A break away from Ivan's plight features the tentative courtship of a captain and an army nurse in a grove of seemingly infinite thin, bare birch trees; the dance culminates in a stunning low-angle shot of a kiss while he holds her aloft above a trench. In dreams, Ivan is free once again to commune with nature; a cart spills a cascade of apples and he runs across a beach, utterly carefree. The visual poetry here is so assured and so coherent, it's hard to believe this is the work of a beginning filmmaker. While Tarkovksy would go on to carve out a fairly different filmmaking niche for himself, Ivan's Childhood is a fully formed and masterful debut. 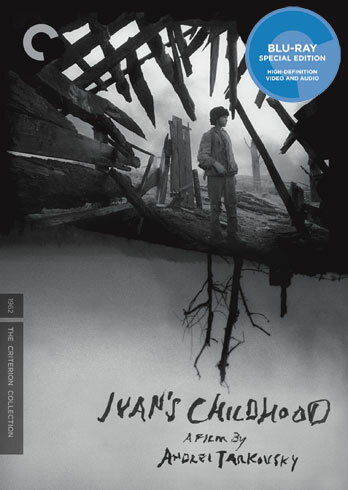 Ivan's Childhood is presented in 1080p high definition in its original 1.33:1 aspect ratio. This is a superb transfer by Criterion, reproducing the delicate shadow work of Tarkovksy's black-and-white palette with fantastic detail and clarity. Blacks are rich and deep, while whites remain crisp and stable, and fine detail is abundant even in the many darker scenes. The presentation is thoroughly film-like throughout. Audio is presented in a problem-free lossless monaural track. Everything from Criterion's 2007 DVD release is ported over here. A 30-minute interview with scholar Vida T. Johnson offers up background on the Soviet film industry at the time and Tarkovsky's introduction to the project, while interviews with cinematographer Vadim Yusov and actor Burlyaev feature their perspective on the film. The set also includes a substantial booklet with essays by scholar Dina Iordanova and Tarkovsky, and a poem by the filmmaker's father, Arseny Tarkovsky. An unforgettable debut film gets a beautiful high-def upgrade.